Jonny Bairstow hit 198 and Joe Root 190 not out to give champions Yorkshire control against Surrey after a shaky start to day two at Headingley. The England pair put on 372, a record fourth-wicket partnership for Yorkshire. They came together at 45-3 after Adam Lyth, Gary Ballance and Alex Lees fell in the first hour. Bairstow, dropped on 134, eventually fell to James Burke as Yorkshire closed on 486-5, leading by 156 runs. Having failed to win any of their opening three matches this season, Yorkshire made a poor start when Lyth was lbw to Ravi Rampaul for 13 in the fourth over of the day. Ballance did nothing to enhance his hopes of an England recall by playing on four overs later, while Lees jabbed at one from Tom Curran which he could have left and was caught behind. 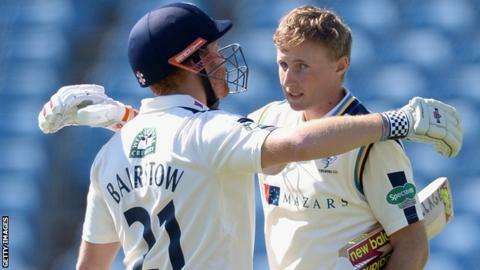 Bairstow and Root were soon established, however, and launched a counter-attack which saw Yorkshire score 162 in 27 overs during the morning session. Although the tempo slowed during the afternoon, Bairstow's century took only 96 balls and Root's 110 as the Surrey attack toiled. Arun Harinath could not hold a diving chance at mid-on offered by Bairstow, who was later taken by Kumar Sangakkara. Captain Andrew Gale became Rampaul's third victim before the close, with Root content to bide his time and press on for a double century on day three.